On June 6, 1944 at 6:30am, a large Allied operation under the Supreme Command of U.S. General Dwight D. Eisenhower, landed on the coast of Normandy, France. Over 160,000 soldiers primarily from America, Britain and Canada were landed that day in the largest amphibious invasion in world history and at least 12,000 of those lost their lives, many of them from Texas. 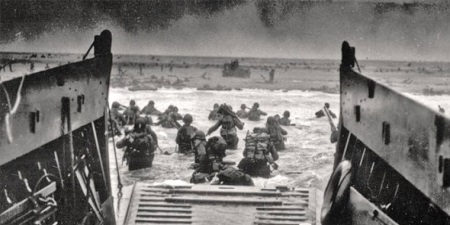 As the years pass by, and as America loses more and more members of the Greatest Generation - it becomes too easy to overlook the importance of this day. It becomes too easy to forget the terrible cost that was paid to throw back the tyranny of an evil which threatened our world. It also becomes too easy to fail in our duty to honor these heroes who earned liberty and a world of freedom with their blood and their lives. As Texans, we should take pride in our state's contributions on that day. Among the American forces used in the D-Day invasion was the U.S.S. Texas - a 573-foot battleship which provided bombardment and firing support for landing forces during the invasion. Positioned several thousand yards from the coast, the Texas focused much of her firepower upon Omaha Beach, destroying numerous Nazi targets to cut off enemy reinforcements and assist the Allied troops in their strategic movements. One of my personal heroes is a great Texan who stood apart for his leadership on this day - Lt. Colonel James Earl Rudder. As commander of the 2nd Ranger Battalion, he and his forces landed by amphibious vehicle at Pointe du Hoc and scaled 100-foot cliffs under heavy German fire using rope ladders. More than 50% of Rudder's Rangers were casualties in the attack, and Rudder himself was wounded twice, but they were able to capture the strategic artillery position and neutralize the German firepower that would have killed countless more American soldiers on the beaches on Normandy. After the war, Rudder returned to Texas where he went on to become Texas Land Commissioner and later, President of Texas A&M University. I couldn't agree more, Mr. President. And I also pray that as a country - America has not lost her way, her morals or her cause. Those of us who love liberty and are willing to battle tyranny will fight to our dying day to prevent it. God Bless our Veterans and their families on this day.